SINGAPORE — South Africahas won its first HSBC Singapore Rugby Sevens at the National Stadium with an electrifying 20-19 win over Fiji. The Springboks continued their fine form from yesterday’s pool matches and breezed through today’s matches to reach this year’s Cup Final. Fiji improved hugely from a disappointing round yesterday and looked dominant in the first half of the match, however South Africa’s perseverance and determination ensured the team leave Singapore with the trophy. South Africa head coach Neil Powell, “I am very happy. On day one, the boys played especially well. I’m thrilled they’ve put in so much effort over the last two days and reaped the rewards of their hard work. Going into the finals is always going to be difficult – it’s natural to have a bit of doubt and disbelief. I think just going to the field and telling the guys that we’re still in the game and if we score first we can give ourselves a shot at winning this helped to inspire the younger players. They hung onto every word we said and started to believe it. Said Fiji head coach Gareth Barber, “We knew we were up against a good side, we knew they’d come back at us. They created momentum in the second half and we didn’t deal with it, and they deserve that at the end of it because they fought hard. As a team, we got quite a few injuries. Everybody’s the same, you fight your way through it.We worked so hard, we lost our spiritual leader, our talisman, in the first game yesterday. If we side kicked or gone for a penalty, we would’ve won the game. With a crowd of almost 57,000 over the weekend, the action on the second day kept fans glued to their seats. End to end action, pumping tunes from Broadway’s Rock of Ages and breathtaking moments of glory and heartbreak made it a sensational atmosphere for the spectators, and truly showed the magic of the Family Sevens here in the city state. The big upset from this afternoon’s Cup proceedings was last year’s champion Fiji knocking out two-time Singapore Sevens winner New Zealand in the quarter finals (5-19). New Zealand were the only side out of the Top 5 to not make it through to the semifinals. Along with the electrifying professional rugby on the pitch, the Singapore Schools U14 Sevens Series final took place on the hallowed turf with St Andrews walking away with the title by beating longtime rivalAnglo-Chinese School (19-17). Fans also got the opportunity to engage in some fantastic chancesto add value to their HSBC Singapore Rugby Sevensweekend. The return of the HSBC Hot Seat enhanced the in-stadium fan experience with fans winning a session in the Hot Seat by participating in the HSBC Dance Cam. The HSBC Hot Seat is a dedicated zone with the best seats in the house, offering an unhindered view of the action on the pitch. Dressing up for the HSBC Singapore Rugby Sevens is a tradition, and spectators got to experience a specifically curated Best Dressed contest with chances to win exclusive prizes and experiences worth thousands of dollars from their seats. The Vinning family, who dressed as popular cartoon heroes The Incredibles,won the ultimate prize (airfare and accommodation) for two to the Paris Sevens in June this year. “With the HSBC Singapore Rugby Sevens being a family sevens, we had to find a costume that could encompass an awesome family. We thought The Incrediblescould embrace that. We’re going to Paris on the weekend of the first of June and that’s actually my 40th birthday!” said Victoria Vinning. The weekend’s non-rugby entertainment didn’t just stay inside the stadium. International fans and locals alike got the chance to attend the enhanced FunZone that featured appearances of The DreamWorks All Stars, Trolls and Minions by Illumination. The all new Singapore Sevens Splash Party and Makan Hub set the family fun tone and the stage performances by Super Dudes also got the kids engaged with the weekend celebrations. Guests to the exclusive Greenyards Club also enjoyed premium hospitality where they rub shoulders with rugby legends including Waisale Serevi, Huriana Manuel, DJ Forbes and George Gregan. 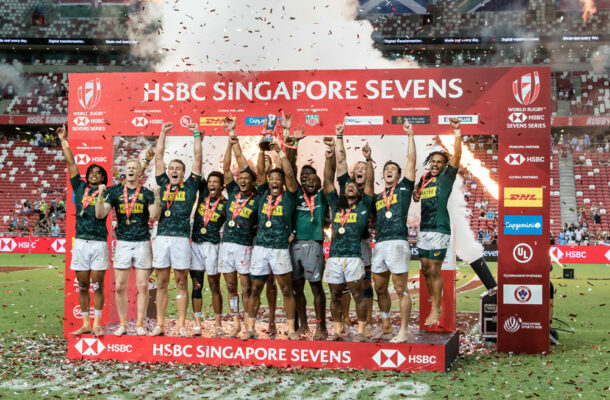 The HSBC Singapore Rugby Sevens two-day celebration has reaffirmed the countries position as the biggest celebration of rugby in Southeast Asia. With the 4-year renewal announcement made by World Rugby a few weeks ago, we can now look forward to next year’s event which will take place on 11 & 12 April at the National Stadium. Tickets for the HSBC Singapore Rugby Sevens 2020 will be announced via the Singapore 7s website www.singapore7s.sg.